Trailhead and parking area are on Ossipee Park Road in Moultonborough, NH. Ossipee Park Road leaves the north side of Rt. 171 0.5 miles east of Rt. 109. Drive about 1.5 miles up Osipee Park Road. Parking is available at a small pull-off just after the gate or along the road past Cones in the Clouds Ice Cream. The trail begins at a wide horse path leading left from the road between the ice cream stand and the second parking area. 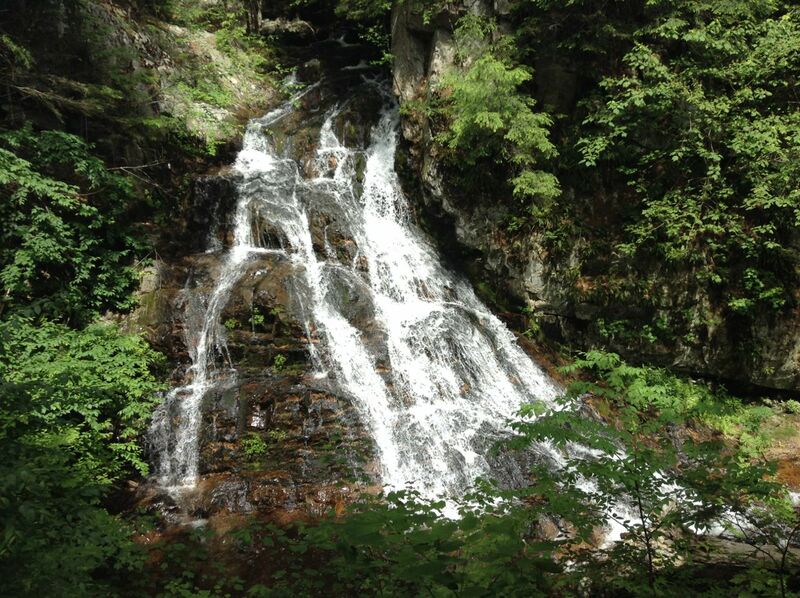 Scenic Sharon Brook is the source of seven pretty waterfalls and cascades, including the 40-foot Fall of Song. Brook Walk is a scenic hike along the brook, passing all seven cascades. The trail begins at Shannon Pond, the center of a trail network in the LRCT's Castle in the Clouds Conservation Area. From the trailhead, Brook Walk heads downhill along a horse path. In 0.1 miles, the horse path bends to the left to cross a bridge over Shannon Brook. Brook Walk turns right and heads into the woods just before this bridge. Immediately, you will see the first cascade, Roaring Falls. It is a small cascade which flows under a ledge into a pool. Each of the waterfalls along the path has a sign with information about it. The next cascade is Twin Falls, which seems a strange name for this normal set of little plunges. The picture on the sign shows how it is a 'twin'. The path leads up to the top of the ravine and away from the brook, where you look down on Whittier Falls, a waterfall with two drops. Continuing on, the fourth cascade seems to be nameless, and is signed as "Harriet's Bridge and Cascades", as it was once the site of a bridge. The next cascade is Emerald Pool Falls, a pretty water slide into a green-tinted pool. The sixth waterfall, Bridal Veil Falls, is the largest so far, and is one of the most beautiful. As the water pours over the rock, it fans out in the shape of a bridal veil. After this, the trail descends to a boardwalk to the last waterfall, Fall of Song, half a mile from the horse path. This one is the tallest, at 40 ft. It is a unique and beautiful waterfall, as it is a straight and narrow plunge set back in deep rock walls.